South Africa openside Heinrich Brussow announced himself as a special prospect by outplaying the revered Richie McCaw in Bloemfontein on Saturday. Brussow's turn helped the Springboks to a 28-19 victory and sealed his place as one of the brightest prospects in the world game, backing up the reputation he secured during the recent British & Irish Lions tour. With his arrival in mind, we take a look back at some other star-making performances in our latest Scrum Seven. In 1982, 20-year-old David Campese prepared for his international debut the only way he knew how - by baiting and upsetting his opponents with some trademark verbal barbs. His target on this occasion was great All Black wing Stu Wilson, whom he inadvertently angered by responding 'Stu who?' when asked of the challenges of playing against the experienced Kiwi. Campese maintained in the aftermath that he genuinely didn't know who Wilson was due to his rugby league background - but he duly gave him the runaround anyway, scoring a try on debut after Wilson failed to deal with a chip. The Wallabies lost the game, and the series, but few could overlook the talents of the cocky new Wallaby. Being a scrum-half in Wales is a difficult task. In recent years Rob Jones, Rob Howley, Dwayne Peel and latterly Mike Phillips have all excelled to Test match recognition with the British & Irish Lions - only to be compared to a certain Gareth Edwards. Before Edwards redefined the landscape of Welsh rugby in the 1970s, fans had another well celebrated scrum-half to eulogise about in Haydn Tanner. Alongside his cousin, and fellow Gowerton pupil Willie Davies, Tanner announced his arrival in the game aged 18 - performing the small feat of beating the All Blacks twice in two months in 1935. In the colours of Swansea he played a huge part in an 11-3 win at St. Helen's , prompting All Black skipper Jack Manchester to plead with journalists: "Don't tell them back home that we were beaten by schoolboys." On December 21 the same year, Tanner made his international debut against New Zealand at the National Stadium, winning 13-12 on this occasion. Edwards never tasted victory over the All Blacks in Welsh colours. Images of Irish centre Brian O'Driscoll scything through the Australian defence in the colours of the Lions have become iconic as a defining moment for the player and an all-too-rare positive image from the 2001 and 2005 tours. 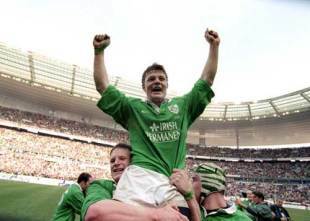 It was a year earlier that O'Driscoll announced himself as a rare and abundant international talent however, when his hat-trick of tries secured victory for Ireland over France in Paris for the first time in 28 years. The 27-25 victory, so perilous after Gerald Merceron had kicked 20 points for the home side, began a decade in which O'Driscoll would spearhead Ireland's Triple Crown wins in 2004, 2006 and 2007 and eventually their famous Grand Slam in 2009. The 1995 Rugby World Cup produced some of the most iconic images in the history of the sport, notably the final moments of the tournament where victorious Springbok skipper Francois Pienaar was presented with the Webb Ellis Cup by Nelson Mandela. On the losing side that day at Ellis Park was rugby's first global superstar - All Black wing Jonah Lomu. The international stage had never seen a performer like Lomu, who in the semi-final against England put in one of the all-time great performances. He scored four tries as the All Blacks swept aside the English - his most famous career try coming as he ran, literally, over the top of Mike Catt to score. His international career was cruelly curtailed by kidney disease, but in 1995 Lomu looked to have the world at his feet. England's Russian Prince, Alexander Obolensky's debut in a white shirt produced two of the most famous tries in the history of English rugby. Having fled to England with his family in 1917, Obolensky took up rugby aged 15 and after winning a blue for Oxford in the Varsity match he was picked to make his England bow against the All Blacks in 1936. Despite not being and English citizen at the time of his selection, Obolensky thrilled the Twickenham crowd as his lightning pace provided two tries in England's first win over the All Blacks. The presence of Pathe News Cameras immortalised Obolensky's debut for generations to come, the flying wing making only three further appearances for England before his death in an RAF training accident in 1940. A folk hero in Wales, it was in the red of the British & Irish Lions that fly-half Barry John cemented his place as one of the most audacious talents in the history of the game. On the 1971 tour of New Zealand, John produced a faultless display in the Test matches. After winning the Five Nations Grand Slam with Wales he turned his attention to the All Blacks, terrorising fullback Fergie McCormick in the first Test with a ferocious tactical kicking game. In the second Test he ghosted through the All Black defence for one of his most famous tries, finishing the victorious series with 30 of the Lions' 48 Test match points. His premature retirement from the game came only three Tests after his return from New Zealand in 1972 - leaving this series as both the finest example of his skills and a telling reminder of what could have been. In 2005, Clive Woodward's British & Irish Lions travelled to New Zealand in record numbers. Among them was a fit-again Jonny Wilkinson, who had made his return to the international stage in their draw with Argentina at the Millennium Stadium. Wilkinson was selected at inside-centre for the first-Test, watching as a young pretender kicked New Zealand to a 21-3 victory. The All Black was Dan Carter, playing only his fifth Test at fly-half. In the second Test Wilkinson started opposite the young Cantabrian and was powerless to stop him from tearing the Lions apart. His final tally in a 48-18 win was two tries, four conversions and five penalties. A 33 point haul to ensure the passing of the torch.